Christmas Tree Worms in red, blue, white, yellow! My passion for the depths urge me again to make room for my last dive of the year. All the hullabaloo didn’t keep me tied, and again prod the inner mermaid in me to disappear into the depths, to another world. colorful depths of Red Sands! We made it though, but arriving late at the resort, all the dive boats sailed off already to Mantigue Island and Medina. After more than two hours of waiting and taking our complimentary lunch at the resto, Angel and I went down to the diveshop to prepare and gear up. I guess we’re just dying to be in the waters for our dried up gills! 🙂 Just in time when Sir Dong came back from Duka Bay, we had some catch-up talk until we sailed off for our first descent at Sipaka Point. 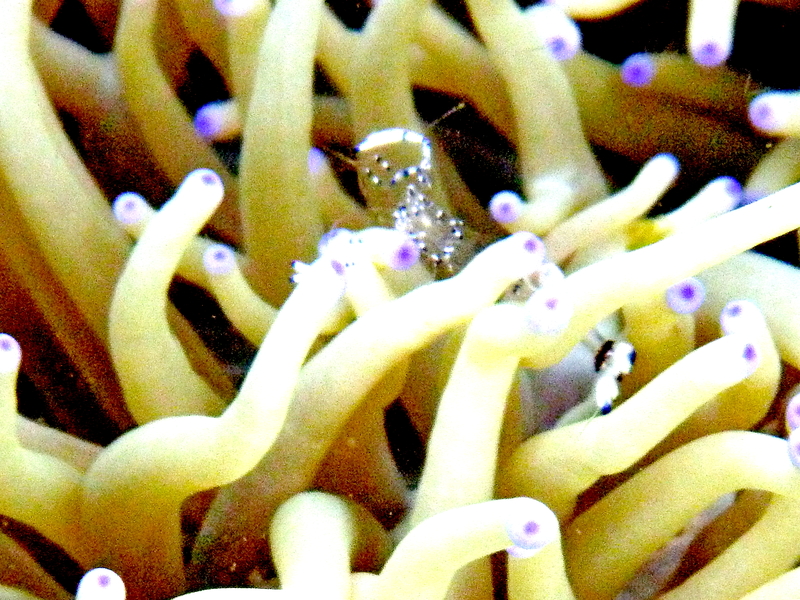 Can you find the cleaner shrimp? Although Sipaka is just nearby from the resort, it belonged to the next coastal town of Talisayan. The spot wasn’t new but I was sure there is something more I will find since I last explored its depths. Back-rolling for our first water entry at the Red Sand, we separated from the boat with group of OW students having their exercise at the spot. We descend on a sandy slope with Danny as our dive guide – we are now confident to go down with no DM. 🙂 We sighted variety specie of soft and hard corals, sponges, colorful crinoids, cucumbers, anemones and even crown of sea thorns. We sighted also a banded sea snake slithering from us as we took turns for photos! 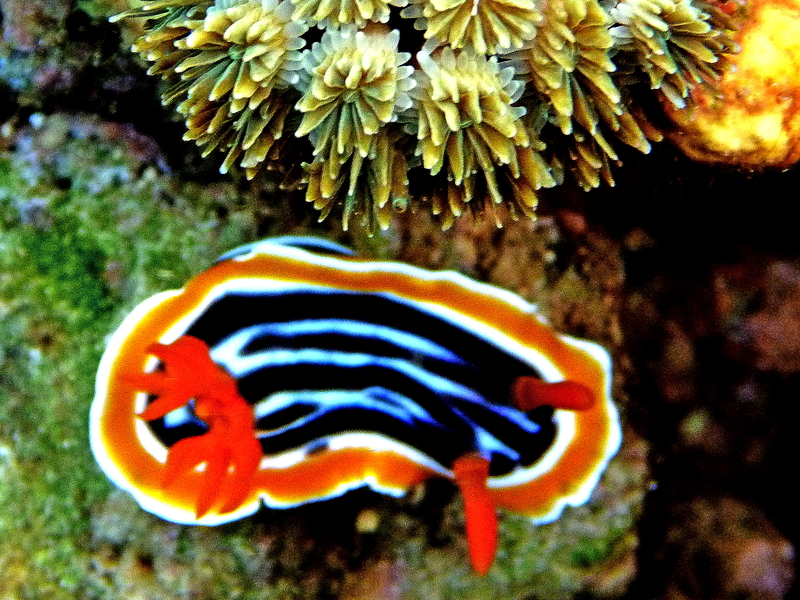 We moved around and searched for more critters – spotted colorful nudis, elusive cleaner shrimp and juvenile fishes. I was amused with the jerky many spotted sweetlips – we keep on following as it kept darting when we took photos. 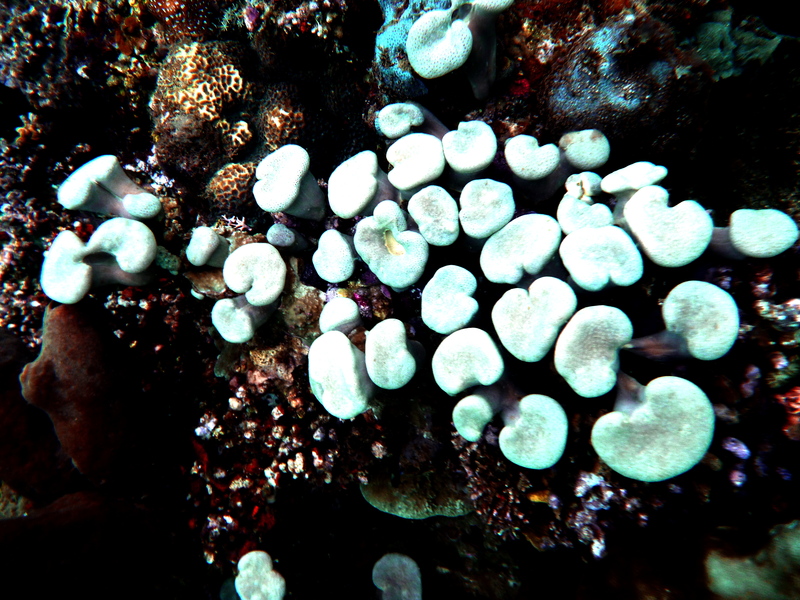 😛 We found uniquely shaped corals – like mushrooms, like suntan flora, like thorny fruit and more. 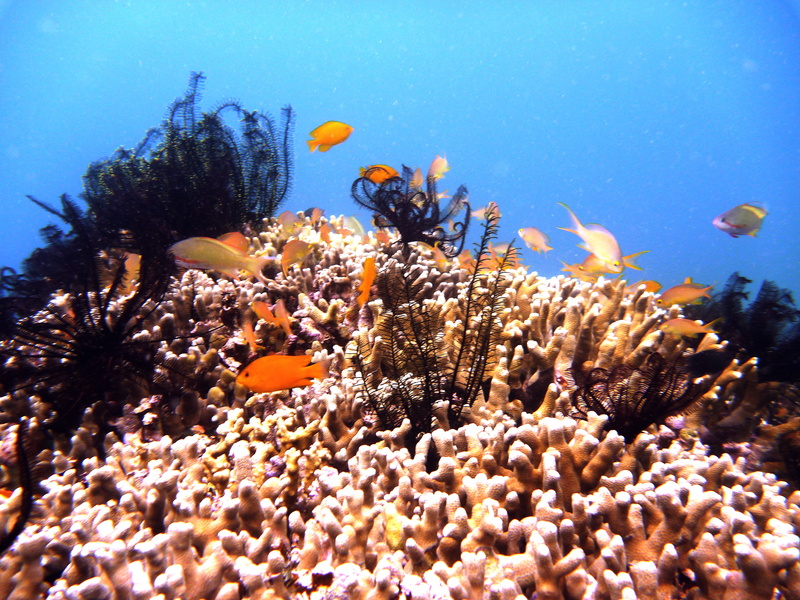 There was no encounter with pelagics but the colorful tropical fishes decorating the corals was all there in splendor creating a colorful underwater and active fish life. We ascend after 62 minutes still having 1000psi of air. We were grateful the shop arranged for our second descent together with John (Australian), who wanted to search for mandarin fish. Leisure talk with Sir Dong – right, for next dive trips! J Good food, idyllic environs with good weather while watching Camiguin Island in the horizons, was a perfect surface interval for me. Though it was late, there was no rush as we waited sundown for our night dive. We boarded the boat in twilight and cruised for about 15 minutes to Talisayan Shoal getting thrilled what to find, it was our first time at the shoal. I always find night dives as challenging and exciting! The plan: DM Cena will look for mandarin fish while the dive guide stay with John, we will follow them as we do our own exploration. It was almost dark when we descend at 5:52pm on a sandy area. The dark underwater seemed another world to me, armed with our torches we started our search – search for the unknown! We spotted critters – crabs, shrimps, juvenile lion fish, clams, and more. Angel pointed out a juvenile puffer fish with those green pleading eyes! We went around getting familiar with the darkness, only to find out we were separated from the others. It didn’t bother us as we continue to roam around. Indeed, at night different species showed up. We stayed close to the seabed as we continue our search, I felt something crawling on my bodice – a crinoid stuck with me! 😛 In a while, we noticed a flickering light beyond us, following it we caught up with our companions. We ascend after 68 minutes with my air still at 1000psi, at 7pm it was all dark surrounding us. The cold night air gave me shivers as we sped off to the resort. Perhaps a dive in far-off waters is just ordinary for some but the sights in our two descents were not usual ones – we had more of colorful macros and colorful active marine life. I couldn’t help again to be more passionate with marine life as I view my photos, you know – that fire within. How vast and mysterious underwater world is, and how fortunate I am given the privilege to experience this grandeur. Even with battery of cancelled trips, my after birthday weekend dives with my favorite dive buddy was more than enough for my dried-up gills and itching fins. Life can be more beautiful deep down! NB. I use Lumix TS2 with Ikelite casing. It was on a sunny mid-day while preparing for our first open water dive, our dive instructor gave us a surprise – to view the whale shark trapped in a fishpen in the next coastal town of Talisayan. Ah! It was not part of the dive lessons but we were excited with the idea. So together with Julien & Joyce on board the glass bottom boat we cruise for Talisayan. Dressed in wet suit, mask, snorkel, booties & fins we prepared to get down but we were stopped by the caretaker of the pen, snorkeling inside the pen is not allowed as it would disturb the fishes and surely affect their catch. After negotiating, I swam wondering if I could make it there without bouyancy device. We swam & linger on floating and waiting (I made it though), and finally sighted the whale shark. Wow! 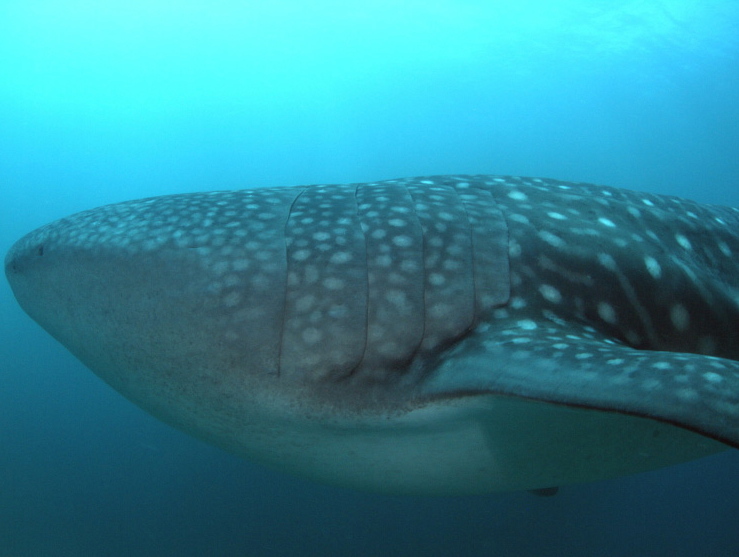 A 30 foot dotted whale shark, gracefully swimming… I never imagined I got the opportunity to see such wonderful creature! J So beautiful, it was amazing! We hastily left the area, as the caretaker never left his eyes watching us. We cruised back to Sipaka Point to have our first open water dive. I can’t wait for it, such adrenaline rush! Note: Photo courtesy of Mario J.